Siriki Dembele in action for Posh. 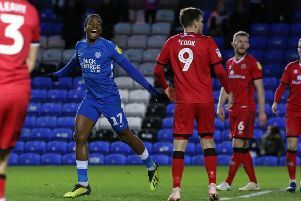 Peterborough United manager Steve Evans has called on referees to offer young winger Siriki Dembele more potection from the League One bully boys. Evans was angry with the treatment dished out to his exciting 21 year-old talent by Charlton players in Tuesday’s bruising League One encounter. He felt referee James Linnington could have sent off two home players during the game and he fears such challenges could become a regular theme as defences struggle to contain Dembele. The bargain signing from League Two side Grimsby will be in action next at Plymouth on Saturday (August 25) - a fixture that boiled over last season when Posh players Steven Taylor and Liam Shephard were both sent off. “Siriki was twice tackled around his waist area at Charlton,” Evans fumed. “And that should have meant two red cards. Top talents like Siriki need protection. Of course they should be marked closely and challenged, but there’s no place in the game for what I saw at Charlton. “Siriki started that game so brightly I think it was the only way they could stop him. It could easily happen again so I want referees to keep an eye on it and act firmly.